For many people, nothing can replace the look of a traditional wood fence. Wood is the only natural fence material and has long been valued for its classic beauty as well as its durability. 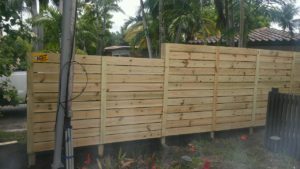 In South Florida, wood fences are build using pressure treated pine so wood fencing is also one of the most cost-effective types of fence on the market today. Palm Beach County codes require that wood fence be built with a post every 8 feet. In Broward County a post is required every 4 feet to meet the wind load requirements in our high velocity hurricane zones. Palm Beach residents wishing a stronger fence may opt for posts every 4 feet as well. Please take a moment to learn more about your wood fencing options. Board-on-Board wood is one of only two fencing options available that provides total privacy (the other is tongue and groove PVC). By overlapping boards on one side of the fence, typically the outside, Ace creates a virtually gapless fence that will always keep your property private. 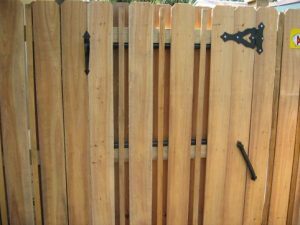 Fences constructed only with side-by-side boards (called Stockade) can lose their privacy over time because of natural changes in the wood due to absorption and loss of moisture. The small gaps can become irregular resulting in some larger gaps. 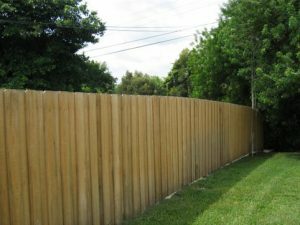 Board-on-Board fencing is an excellent option for any homeowner looking for a functional, attractive fence that also provides the privacy and durability desired. Vertical Shadow Box is the classic wood fence design people choose most often. 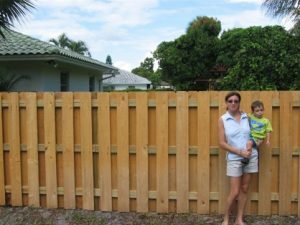 Alternating boards on each side of the fence gives the homeowner on the inside of the yard a “good side” of the fence to view as well. With board on board, all the pickets are on one side, and that side is required by most cities to be facing the street or the neighbors. The homeowner on the inside sees the posts and horizontal members of the fence. Palm Beach County, and certain cities therein, are more lenient regarding requiring the good side to face out. In many cities the good side may face in if the fence is up against an obstruction such as a neighbor’s fence. Vertical shadow box is a semi-private fence style because when looking from an angle, one can see into the yard to some degree. Vertical shadow box is also durable, functional and cost effective. The price of vertical shadow box is the same as board on board so the choice should be made depending on whether total privacy or having a good side to see from inside the yard is the more important consideration. In some cases, as stated above, both may be achievable. If there is a pool in the yard, vertical shadow box can’t be used because it is considered climbable from the outside. The executive shadow box (please read below) is an option that does comply with the pool code as well as the board on board fence. Perhaps our most beautiful and attention-grabbing wooden fencing option, this model takes the basic shadow box design and adds executive strips (narrower wood pickets) between each board on the outside of the fence. This gives the shadow box fence added privacy as well as compliance with the pool code requirement that a fence not be climbable from the outside. These executive strips can be added to the inside of the fence as well. That is called Double Executive Shadow Box. The Executive Shadow Box is the premium wood choice in both looks and functionality, instantly increasing any home’s curb appeal. look many now prefer is Horizontal. Wood gates should always be built around a steel frame to prevent future warping. Gates should be mounted on a larger post than is used for the fence to prevent sagging and dragging on the ground. Our steel gate frame is our own design and we have built our gates in the way described for many years. If an upcoming fencing project is next on your to-do list, and you’d like to learn more about the wood fencing options available for residential or commercial applications, then don’t wait another minute. 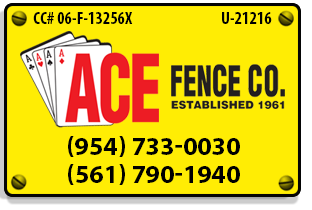 Contact Ace Fence Company today for more information. Why Buy a Wood Fence from Ace? All wood fences are built by Ace, board-by-board, on your property using high quality wood and thick-coat galvanized ring shank nails that don’t rust, bleed or pull out over time. We never buy pre-made wood panels that are often made of lower quality materials. This is another Ace Peace of Mind feature. Ready to learn more? Click here to request a FREE Quote on Wood Fencing! What Are My Chain Link Fencing Options? What are my Wood Fencing Options in Broward County? What Are My Aluminum Fence Options In Broward County?